The Joe Rocket RS-2 Rain Suit is a fully waterproof pant and jacket set that delivers superior performance without an exorbitant price. With the RS-2 you get a 100% waterproof outer shell made from soft polyester with a PVC backing. Inside the jacket, main features include a Variable Flow™ exhaust vent that manages humidity, a zippered front closure with Velcro® storm flap, and an elastic waist that compliments the adjustable cuffs. In the pants you’re getting the same waterproofing and elastic openings including leg stirrups, melt-resistant fabric on both lower legs, and a zippered gusset that makes tucking your boots under the rain suit extremely easy. 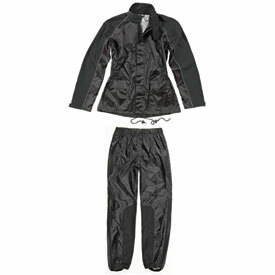 Get prepared for any weather and pick up an RS-2 Rain Suit for yourself.